In the uniquely crafted boutique hotel in the heart of Berlin, historic and modern elements come together to create a harmonious design. Berlin, only a few minutes away from the Reichstag, the Brandenburg Gate and the Unter den Linden boulevard. The decor is influenced by French sensuality and combines individual design with loving attention to detail. 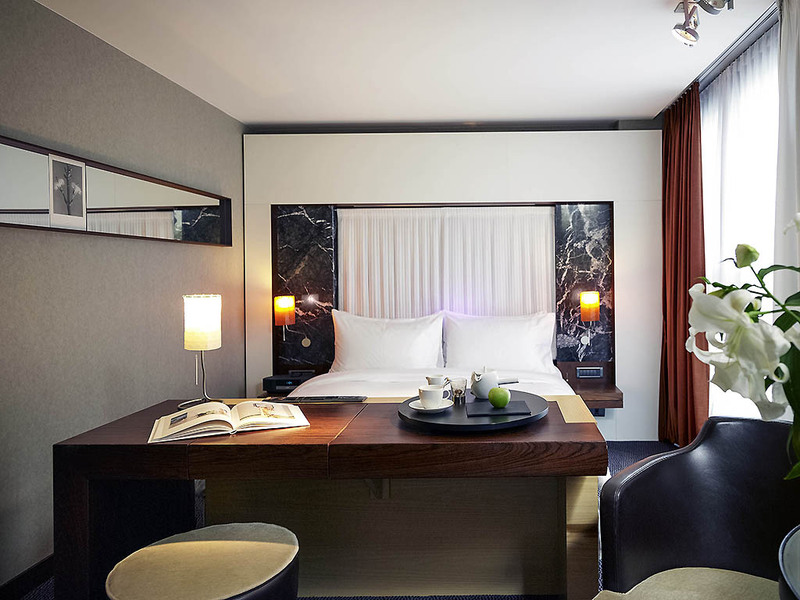 Whether you are visiting for business or pleasure, enjoy our luxury hotel in Berlin in one of our 92 refined rooms and suites, designed by Harald Klein, with leather furniture, elegant textiles and marble. Wake to freshly baked waffles and homemade jams in the light-flooded atrium. Relax on the top-floor terrace after an aromatic massage. Impress guests and clients with a gala reception in the futurist Delphinium ballroom and high-tech meeting rooms. Life is Magnifique in Berlin..
for you to enjoy. A visit to the wellness area with views over Berlin is the perfect way to unwind after an exciting day in the city. Relax in the sauna or enjoy a Swedish or Californian massage. Located in the center of Berlin, the Mitte district is known for its many attractions, including the Brandenburg Gate, Alexanderplatz and Museum Island. Step out to the historic heart of central Berlin: its ancient French quarter and vibrant Gendarmenmarkt. Stroll to the Reichstag, Brandenburg Gate, Checkpoint Charlie and Museum Island - and Berlin's exclusive shopping street of Friedrichstraße. From Berlin's Tegel Airport, take the BUS TXL to Friedrichstrasse, a 15-minute walk or short taxi ride from the hotel. From Schönefeld Airport, take the Express Train to Friedrichstrasse. For detailed information please contact the concierge. 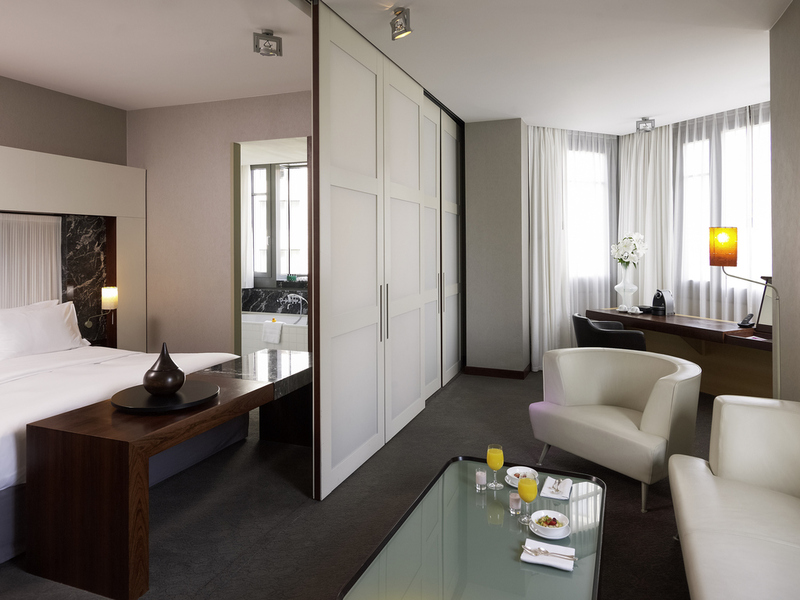 Stretch out in the spacious lounge of a Berlin suite. 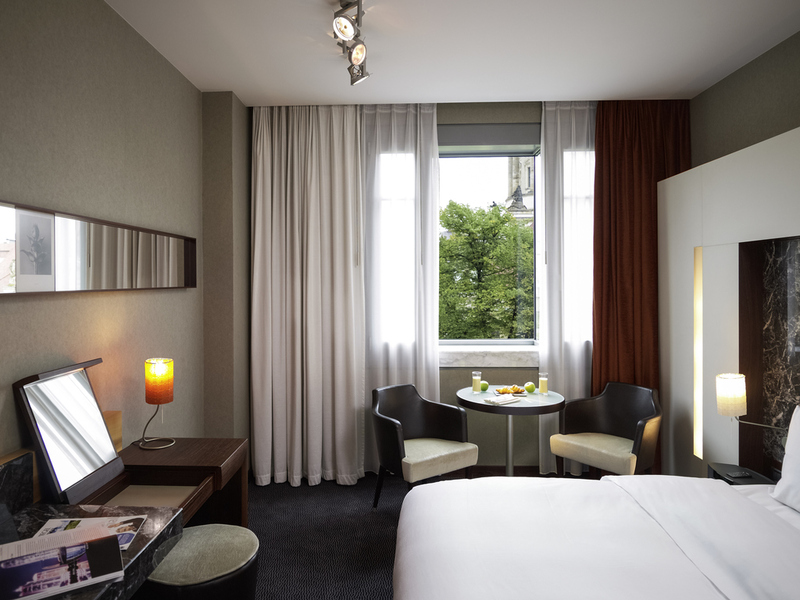 Our 22 Junior, Prestige and two-story Opera suites have views of the Gendarmenmarkt, inner courtyard or French Cathedral. 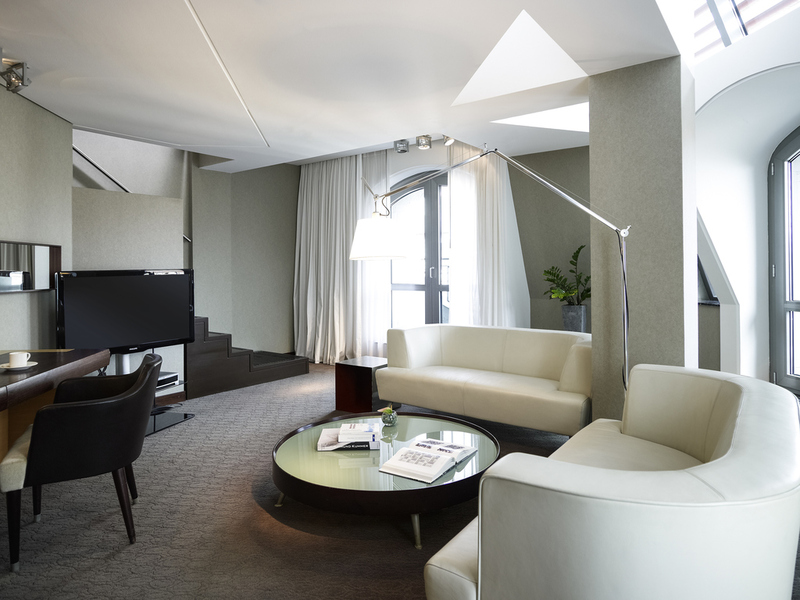 A Nespresso machine, Hermès toiletries and VIP services add to the indulgence. Elegant, 194-sq. ft (18-sq. m) room overlooking the courtyard, Französische Strasse or Gendarmenmarkt. Flat-screen TV, Bose Wave radio, air conditioning and marble bathroom. Some rooms have a balcony. Free WIFI (limited bandwidth) and a bottle of Evian. Approx. 226 ft2 (21 m2), plush design, overlooking the inner courtyard, Französische Strasse or the Gendarmenmarkt. Flat-screen TV, Bose Wave radio, air conditioning, marble bathroom, free, low-band Wi-Fi access and bottle of Evian water. Approx. 25 m2 (269 ft2), plush design, view of inner courtyard, Französische Strasse or Gendarmenmarkt. Hermes toiletries, flat-screen TV, Bose Wave radio, air con., marble bathroom, Nespresso machine, free, low-band Wi-Fi access, bottle of Evian water. Approx. 35 m2 (376.8 ft2), plush design, view of inner courtyard, Französische Strasse or Gendarmenmarkt. 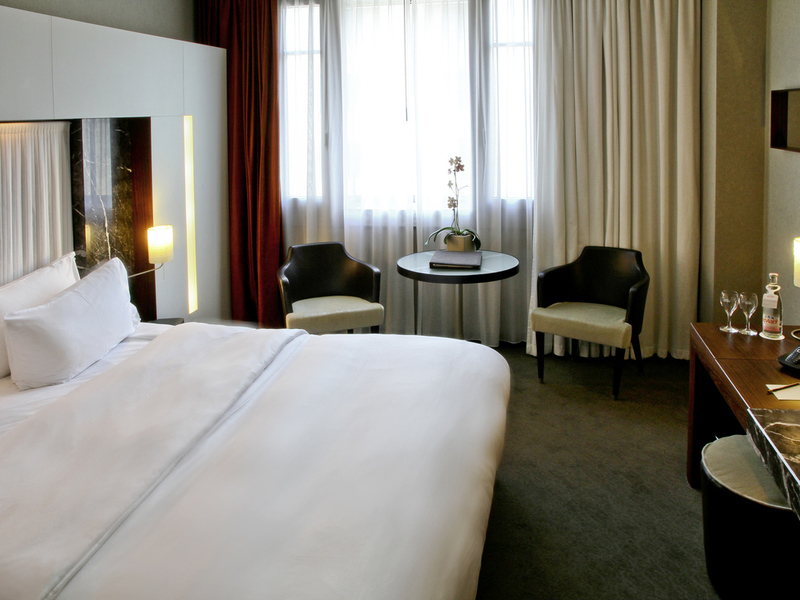 Hermes toiletries, flat-screen TV, Bose Wave radio, air con., marble bathroom, Nespresso machine, free, low-band Wi-Fi. Extra bed upon request. Approx. 45 m2 (484.3 ft2), plush design, overlooking the Gendarmenmarkt. Hermes toiletries, flat-screen TV, Bose Wave radio, air conditioning, marble bathroom with tub & guest toilet. Nespresso machine, free, low-band Wi-Fi access. Extra bed upon request. 82 m2 (882.6 ft2), plush design, overlooking the Gendarmenmarkt. Hermes toiletries, 3 flat-screen TVs, Bose Wave radio, air con., marble bathroom with tub, shower, TV, guest toilet. Nespresso machine, free, low-band Wi-Fi access. Extra bed upon request. The floor lighting in the Delphinium Room at the boutique hotel in Berlin creates a futuristic atmosphere. The event venue in the center of Berlin can accommodate up to 110 guests and is often booked for film events or gala receptions. The Delphinium and the two smaller meeting rooms in Berlin offer state-of-the-art technology and free WIFI. The dedicated team will ensure that your events and conferences run smoothly. Whether it's a candle-lit banquet, a gala reception or a creatively orchestrated coffee break for your conference in Berlin, we can arrange unforgettable and tailor-made events for you. Feel stress melt away with a Swedish, Californian or aromatic massage from our spa's experienced therapist. Located on the top floor, complimentary wellness facilities include a steam bath, sauna and summer terrace. Let us arrange an unforgettable evening at the nearby Berliner Philharmonie concert hall, a masterpiece of the 20th century by celebrated architect Hans Scharoun. Enjoy a performance by the Berlin Philharmonic Orchestra, conducted by Sir Simon Rattle. Nothing restores your energy like an invigorating workout. Our SoFIT Berlin gym has Technogym equipment, with complimentary bottles of water and magazines to enhance your workout. Afterwards, soothe tired muscles in the steam room or sauna.